Posted on Tue, Jan 24, 2012 : 4:20 a.m. I made a double batch of meatloaf this past weekend; one of the loaves expressly reserved for sandwiches. Today my foresight is appreciated. For a really fine sandwich, attention should be paid to the bread. Sandwiching the savory slices between pillows of freshly baked challah is the ultimate, but the fresh baked artisan rolls I used were a toothsome change. I made a lower (everything is relative) fat Turkey and Bulgur loaf, but another favorite recipe is my Meatloaf in Paradise, which incorporates sharp Cheddar into the mix. Several delis, (Whole Foods and Back Alley Gourmet come to mind) offer homemade meatloaf by the pound, if you haven't the time to make it yourself. 1. Combine Dijon and mayonnaise and spread over cut sides of bread. 2. 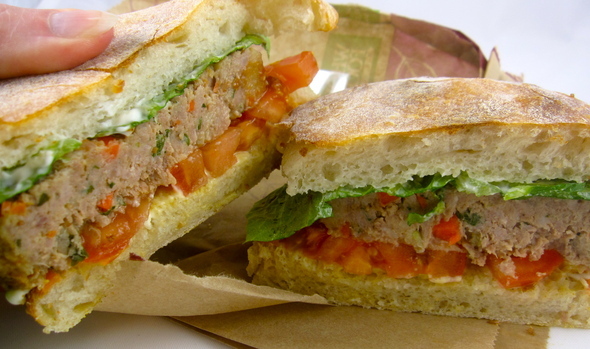 Layer 2 slices of bread with lettuce, tomato and meatloaf. Top with remaining bread, cut in half and serve (or wrap for a brown-bag lunch).